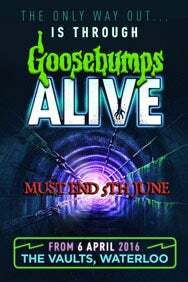 We do not curently have theatre tickets available for Goosebumps Alive This could be because we have simply sold out or it could be that this show is no longer running. The information on this page remains purely for historical and informational purposes. Step into the beautifully haunting world of Goosebumps Alive, a chilling modern update of the 90’s cult horror series. Equal parts terrifying and riotous, the hottest ticket in town puts you in the centre of chilling macabre tales. Given a terrifying makeover from the fiendish minds behind Accomplice (Director), Alice’s Adventures Underground (Designer), and The Tiger Lillies (Music), find out what happens when your childhood fears become your adult nightmares. Journey through the dark, abandoned vaults under Waterloo and walk the knife’s edge of fright and fun in this spine-tingling promenade show, brilliantly reimagined from the classic tales of R. L. Stine. The only way out is through 19 rooms populated by the denizens of your darkest dreams. Will you meet a killer scarecrow, face the haunted mask, escape from a deranged scientist, or be buried aliveor will you find the real horror lurking deep inside your head?